Make a fantastic impression for your next party, potluck or even for yourself by creating your own bánh mì. Add your own pizzaz & personal touches to make these sandwiches special to your own tastes. It can be as simple as assembling the ingredients (if resources are close by) or starting everything from scratch. Depending on how ambitious you are, creating your own version can be a lot of fun & probably better than what you can buy anywhere. 1. Purchase ingredients & assemble: If Việt grocery stores and bakeries are accessible, you can purchase the baguettes from your favorite bakery, meat fillings from a Viet deli and the rest of the condiments from the Viet grocery. Once collected, assembling the sandwiches to your own liking can be fast & easy. 2. Purchasing some ingredients and making the rest yourself: You can cook & customize your own fillings, then just purchase the baguettes and other condiments to finish . 3. Do it all yourself! For all you ambitious and curious cats: Making everything from scratch will take time, but it’s extremely gratifying and fun for those who dare to go there. Although it’ll probably cost you more to make it then to buy the banh mi straight from the source, the joy of creating everything homemade is priceless. Just shop for your raw ingredients and you can go to town with the recipes we’ve provided. Bánh Mì Shopping List- The condiments are optional. Add all or as much as you like. Light, crusty baguette. – Lucky are those who live near a Việt bakery and have access to good baguettes. If your purchase takes you to an outside source and your bread is a little too thick or center dense, you can scoop out some of the center to eliminate some of the bread volume. 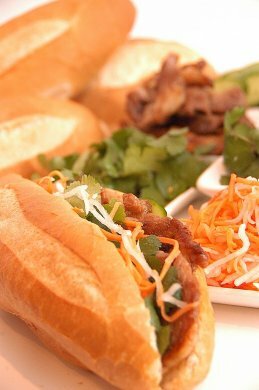 Some Bánh Mì places scoop out their center too, to create more even balance between the bread & fillings. Put the bread in the oven or toaster for a few minutes to create a crusty exterior. Fillings – Meat or Veggie, these fillings can range from anything that has been marinated with Vietnamese sauces or flavors. Pickled Daikon & Carrots – Tangy, sweet and sour add that extra special layer of flavor ! Thin slices of cucumber (seed removed). Japanese , Persian or short, Pickle type cucumbers work best because of minimal seeds. If there are seeds, they are usually very small and tender. Mayo– or any sandwich bread. Some places use a white spread made of egg yolks and vegetable oil. Sriracha or garlic chili sauce for extra flavor and heat. Have fun making your Bánh Mì ! Log in | 55 queries. 0.590 seconds.